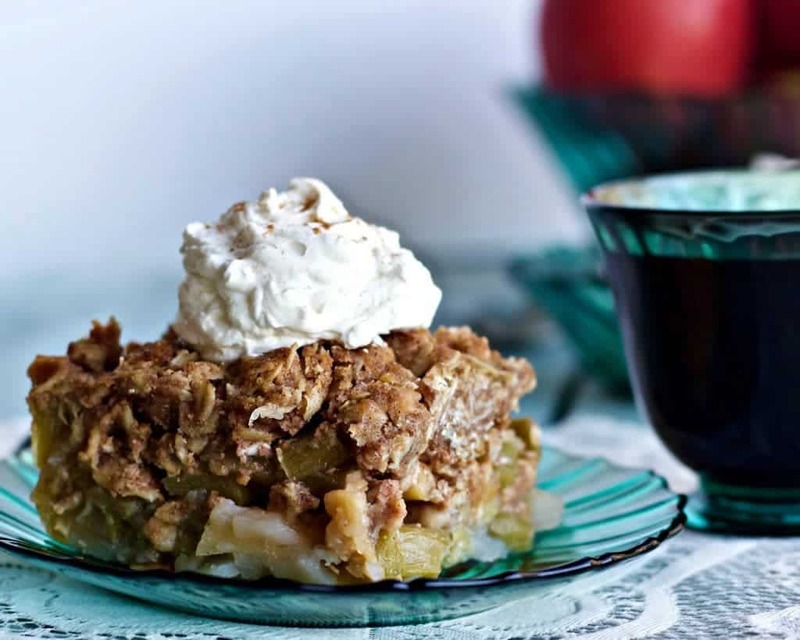 This Mid Winter Rhubarb Apple Fruit Crisp uses fresh or frozen rhubarb and apples. 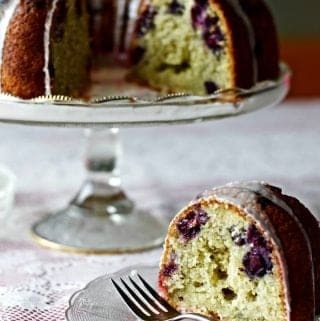 It’s baked with coconut oil and sweetened with pure Maple Syrup to keep it healthy! This recipe is Low-​Sodium, Vegan, Vegetarian and Dairy-​Free! All the fresh produce, aside from a few lingering tomatoes and peppers in the greenhouse, are gone. Dave decided to take this winter off. No winter hoop gardening this year. He’s just too busy with his business! He didn’t get much of a break though. He’s already germinating seeds for the new 2016 tomatoes and peppers. Around here, gardening is going on in some stage of other, most of the year! A crunchy sweet oat topping is the hall mark of a delicious fruit crisp. Right now we are between garden stages. Time to use up the ‘put by’ bounty. So I’m digging into my freezer and creating new recipes with what I have on hand! My freezer is loaded with rhubarb, and I found some frozen apples that I hadn’t already made into apple crisp and Caramel Apple pie! 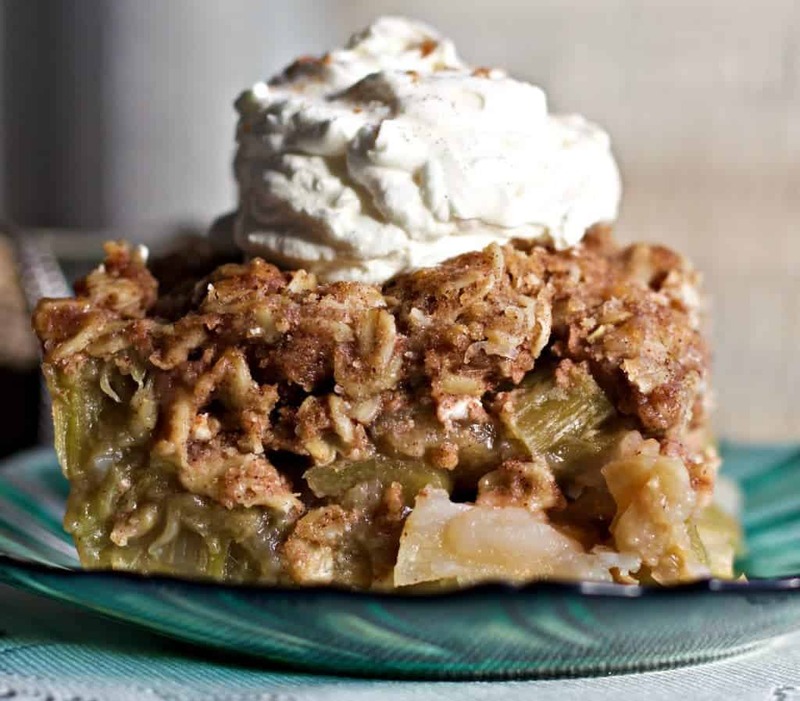 The rhubarb tartness blends well with our apples mild, sweet flavor. Putting them together makes a mellow fruit flavor blend. Pleasing to the palate! I found a recipe for this crisp (linked below), and did my own version. I enjoy baking with maple syrup and coconut oil to make recipes a bit healthier and add a bit more flavor. So tasty! I even sweetened the whipping cream with maple syrup. It’s so good! Notice this recipe is still NOT low sugar. 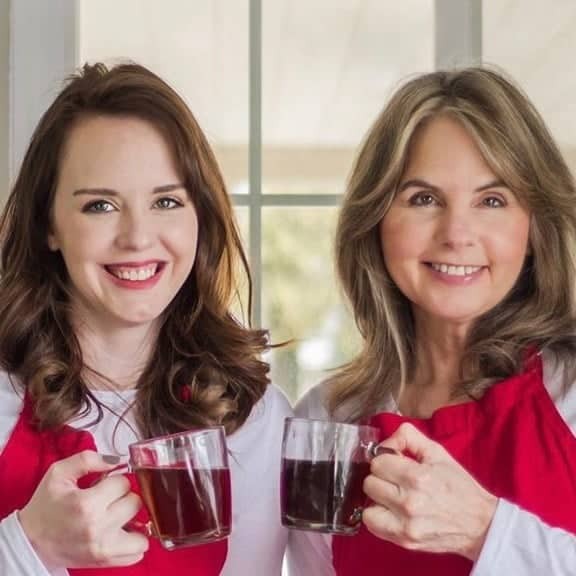 Maple syrup digests as sugar, just a little less of a glycemic hit than white table sugar and it’s lower in calories and fructose than honey. For a good comparison between honey and maple syrup, check out this article by SF Gate. I love both of these sweeteners for different reasons. They are both a bit healthier than sugar but both are still to be treated as sugar in your diet! You can use white sugar and butter one to one with coconut oil and maple syrup if you prefer. Say No to margarine! Please use organic sugar! A closer look at that lovely filling. 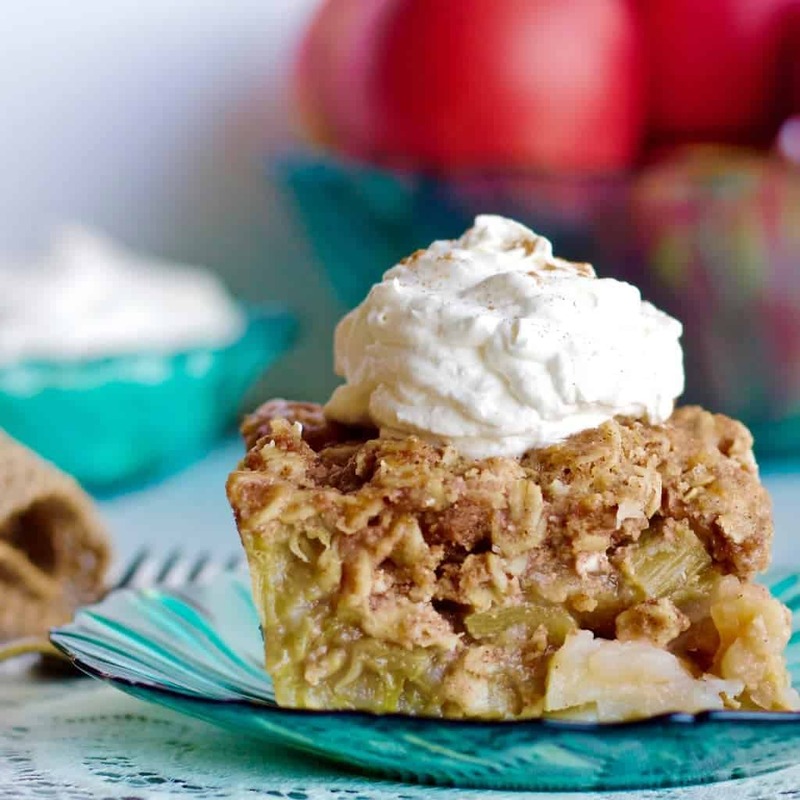 This combination of apples and rhubarb blend beautifully and taste great together! 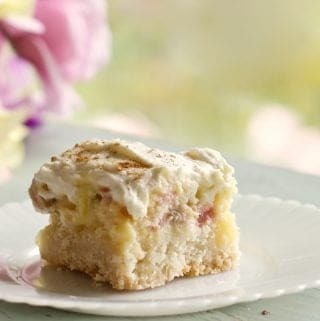 Later in the year I’ll be using other fruits with rhubarb in this recipe. Strawberries, raspberries, blackberries, blueberries…what would you try? Of course, this crisp is excellent with fresh fruits! Because I’m using frozen rhubarb and apples, the liquid content of this crisp is pretty high. You’ll notice I use a LOT of cornstarch for that reason. I COULD have drained the frozen fruit, but I hate losing the flavor of the juice. So I decided to keep the fruit juices. 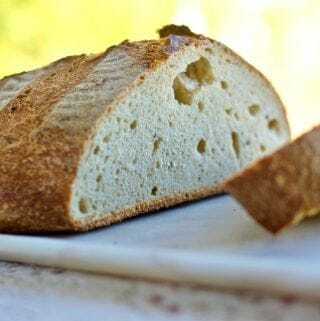 Cornstarch works really well to firm up the crisp without the chalky flavor a lot of flour would add. It came out of the oven slightly loose and firmed up well in the fridge. IF you are making this with fresh fruit, or prefer to drain your frozen fruit as it thaws, I suggest cutting the cornstarch in half. If you are washing the fruit and it’s watery add more cornstarch accordingly. 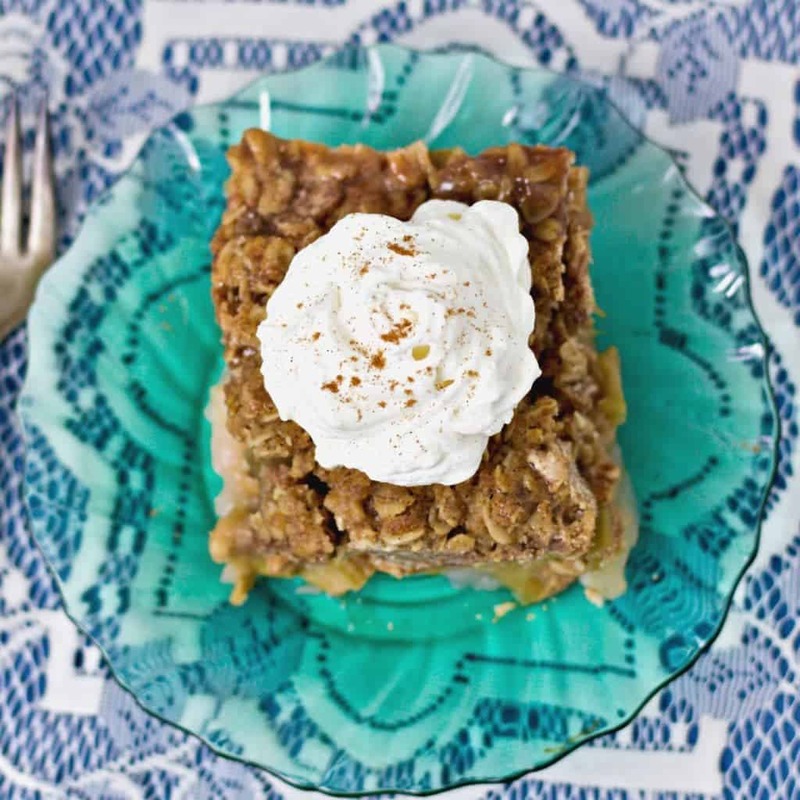 Here’s the simple method for Rhubarb Apple Fruit Crisp dessert! In a [easyazon_link identifier=”B01HTYH8YA” locale=”US” tag=”homefoodjunk-20″]large bowl[/easyazon_link], whisk together Maple syrup (OR organic sugar) and cornstarch. Add fruits to the cornstarch mixture and mix until all the fruit is coated with the syrup mixture. 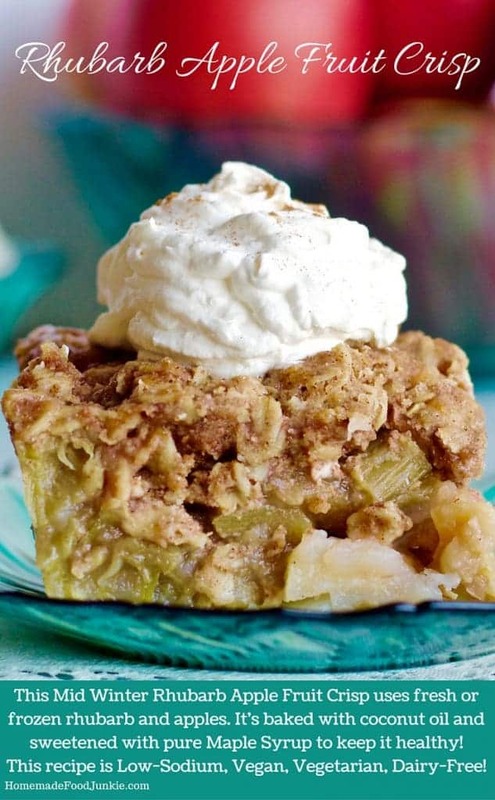 Pour into a greased 8 inch square baking dish or pie plate. In a medium bowl, whisk together the oats, brown sugar, flour and cinnamon. Add the melted coconut oil to the dry topping mix and stir until It’s crumbly. Sprinkle over the fruit in baking dish. Bake 45 minutes until fruit is bubbly in the center and the edges are browned. About 45 minutes. * if using frozen fruits, measure before thawing, drain thawed fruits, but do not squeeze their liquids out! In a large bowl combine Maple syrup (OR organic sugar) and cornstarch. Add fruits and mix until coated with the syrup mixture. In a small bowl, combine the oat, brown sugar, melted coconut oil, flour and cinnamon. Mix it well until It's crumbly. Hi Miranda, Maple syrup is a good substitute for brown sugar. It has a caramel type flavor and is about the same sweetness. You will have to add extra flour until you get the crumbly texture you need. I would love to know how it turns out for you. Have a great day. I haven’t had rhubarb in SO long. It used to be a family staple growing up in NZ. 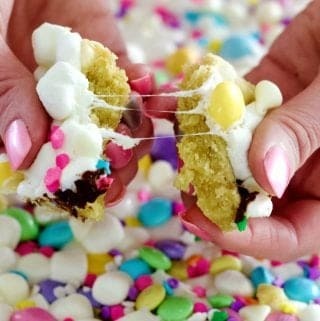 I must find some and make this. YUM!! I hope you can find Rhubarb in New Zealand Kylee. Maybe frozen? That’s what I used and it turned out great! Good Luck!